i-gotU is the brand name for GPS logger from Mobile Action Technology, a Taiwanese company famed for its Handset Manager program. Recently, the company has released an new GPS logging device, namely i-gotU GT-600 GPS Travel and Sports Logger (w/Motion Sensor). Essentially, i-gotU GT-600 GPS Logger is another product from manufacturer of i-gotU GT-200e GPS Logger, with feature addition of motion sensor but removal of Bluetooth connectivity. With the release of GT-600, Mobile Action also made available i-gotU Suite 3.1 software that include support for the new device. Thanks to the company, My Digital Life has a chance to test drive and review the portable i-gotU GT-600 GPS Logger. At first glance, the packaging of GT-600 is almost similar with GT-200e, with little change in color and text description. The i-gotU GT-600 contains a GPS Logger device, which measures 46×41.5×14 mm and weighs 37 grams, Live! Travel Blog Master CD with driver and i-gotU Suite software, USB cable and wrist strap. Over a period of usage, I found that wrist strap is less useful for a photographer. I prefer to attach the GPS Logger to camera bag, but wrist strap can’t do that easily. I would personally prefer i-gotU to comes with a strap hook too, which make securing the device to bag or even belt easier. As mentioned, most of the features, functionality and hardware specifications of i-gotU GT-600 is similar if not the same with i-gotU GT-200e. The main component of i-gotU GT-600 is definitely GPS chipset, which is still SiRF Star III 65nm GPS low power chipset. Instead of Bluetooth connectivity to connect wirelessly to mobile device, cell phone, smartphone, desktop PC, notebook or netbook computer, GT-600 requires USB cable connection in order to act as the GPS receiver for computer only (as mobile device probably not recognizing external GPS device connect via USB). Besides, i-gotU GT-600 does not support dual-mode – simultaneous GPS track logging and navigation, which means the device can use for one function at a time, whether for tracking and logging route or for route navigation. 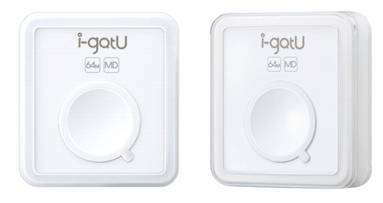 The main highlight of i-gotU GT-600 is definitely integration with motion detector, which serves as auto power on and auto power off component. In other word, it’s not necessary to turn the GPS Logger off when the device is no longer need to be used. When no movement is detected, the motion sensor will put the device in sleep mode to save and conserve battery power. And there is no need to remember to turn on the GPS Logger to start logging and tracking again, as it will automatically on to record GPS data in logger mode when there is movement. In our normal usage, the motion sensor is sensitive, where a slight motion will trigger the GPS logging. And the device will turn itself off a few minutes after been leaving idle, helping to prolong and extend the battery life and GPS data records that able to save considerably. However, do note that the device may need time to get acquire GPS fix again after waking up if the device is idling for too long. i-gotU GT-600 comes with a built-in 750mAh rechargeable Li-ion battery, which cannot be changed. That may cause the device unusable again once the lifetime of battery depleted, and no longer able to be charged. Anyway, the battery life able to last for about 3 to 4 days before recharging is required when we use in normal outing for a few hours a day, with waypoint logging interval of less than 5 seconds. That’s a increase of battery life time over GT-200e, probably thanks to motion sensor. Once depleted, recharging the battery to fullness takes about 2 hours with computer’s USB port. i-gotU GT-600 does not support expandable memory card, and has only built-in 64 MB flash memory to store 262,000 way points. At 5-second interval, it can store around 360 hours of GPS waypoints, or at 1-second interval, 3 days of GPS data for route, speed, distance, altitude, and other valuable information, enough for most occasion before battery empty. If you’re not the one who like to transfer data to PC everytime, but don’t mind losing some recorded data, i-gotU GT-600 supports circular logging, where earlier data is deleted to make room for newer data when the memory space is full. The feature is useful for people who forget to clear and delete GPS data from the device. Manufacturer claims that it takes less than 35 seconds to acquire GPS fix (before logging and tracking can start) with cold start (start GPS device after a few hours of power off). In our usage, where there are high-rise buildings everywhere, the GPS acquisition time can be longer, as long as 5 minutes of more. Sometimes, the tracked waypoints of the route is far off the actual location, especially during the initial tracking period. But of course, it may be caused by high-rise buildings environment where it’s been used. i-gotU Suite is actually consisting of 3 software, namely @trip PC, Sports Analyzer and Where I Am. atripPC is basically the tracking and geotagging software. @atrip PC consists of most functionality to deal with and manage the GPS data logged and recorded on the device, including importing and downloading of GPS tracks from device, upload and share trips to @trip server, create or edit trip, reveal all or portions of the trip, configure hardware settings, customize software settings, clear device data, track management, and of course geotag photos and pictures. @trip makes use of Google Maps and Google Earth to display mapped photo along the path traveled in the main program window and Location Viewer. However, I, and perhaps most users won’t be @trip software other than for the purpose of importing waypoints and geotagging the photos, as the software lacks many image management and editing features that typical image viewer will have. i-gotU Suite does include two new programs – Sports Analyzer and Where I Am. Sports Analyzer functionality is actually also contained within @trip, but been separated into another program specifically for easy access to various data. Sports Analyzer can help to meet fitness goal by tracking workout progress with calendar review, routes displayed on Google Maps, in additional to useful charts and statistics analysis such as duration, total distance, average speed, maximum speed, highest altitude and lowest altitude. Where I Am allows user to determine exact current location Google Maps, Yahoo! Maps or Bing Maps by connecting the i-gotU GT-600 to computer via USB as GPS receiver. However, the program is less useful, as it’s pretty hard to get GPS fix indoor, where most users will use the computer. Unfortunately, @trip software still does not have ability to retrieve location name (such as California instead of just GPS coordinate) to add into the EXIF metadata. User who wants such information in the photos will need to export GPS tracks, waypoints and routes information in GPX format (GPS eXchange XML schema) to import to other GPS geotag software application such as Microsoft Pro Photo Tools or GPicSync with such capabilities. Turn on GT-600 GPS Logger to auto start recording waypoints. 2 LEDs on the device is indicator for on, off, charge, logging, low battery and memory full status indication. Once finished traveling or at the end of the day, connect GPS Logger to PC via supplied USB cable. While connecting, it’s also doubling up as charging the internal battery. Use the @trip software to download GPS data, and “Photo Locator” wizard to geotag photos with location data of GPSVersionID, GPSLatitudeRef, GPSLongitudeRef, GPSAltitude, GPSSpeed in the EXIF header, and GPSLatitude, GPSLongitude and GPSPosition in EXIF composite automatically. 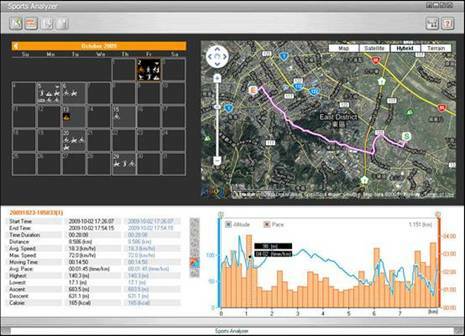 Alternatively, use Sports Analyzer to view route taken during the exercise. Optionally, clear the GPS data to leave more room for future logging, or else just turn on circular logging enabled to auto-erase old data when storage memory space full. You don’t even need to turn off GT-600. It’s automatically off when no motion. Too bad, the unit does not have a memory card reader that user can insert the SD card with photos taken, and get the photos automatically geotagged without having to use computer as intermediary medium. The feature continue to be a wish list. i-gotU GT-600 GPS logged records must be retrieved and downloaded via @trip software, as the device is not accessible as USB storage device. However, once imported into @trip, the route or trip can be exported in multiple file formats, such as CSV and GPX. Besides, the trip data with photos can be exported as ZIP, MHT, or KMZ files for immediate Internet sharing including in 3D View and as web album. i-gotU GT-600, like GT-200e and GT-120, still lack of 64-bit Windows 7 support, although promise has been made to release it on mid January (has since delayed to mid February), causing without pressing F8 to disable forced driver signing during boot up, it’s impossible to connect any device on x64 Windows 7. However, it packs all other features that one needs of a GPS Logger, including ability to change waypoint tracking interval, and increase or decrease the interval on change of velocity. Update: 64-bit driver for Windows 7 and Vista is now available. While the GPS geotagger inclusion in digital camera is slow to taking off, standalone GPS Logger is important investment for everybody who wants to know precisely where photos are taken. The GPS Logger can also be used for sports enthusiasts to keep track of the activity, and straight forward, easy, and time-saving way of geo-tagging the photos automatically. i-gotU GT-600 USB GPS Travel & Sports Logger is currently priced at $119.95 at Amazon, a bit on the high side when comparing with equally good i-gotU GT-200e Bluetooth Travel Logger (aff) , now at $99.99, and other products from i-gotU such as lower-end i-gotU GT-200 Bluetooth Travel Logger (aff) and i-gotU GT-120 Travel Logger (aff), where all of them can work to track and log important GPS waypoints information to geotag photos. Which one to get is definitely according to your own preference. One with motion sensor for better battery life (GT-600), or ability to act as GPS receiver for smartphone via Bluetooth while continuing to track GPS data (GT-200e).